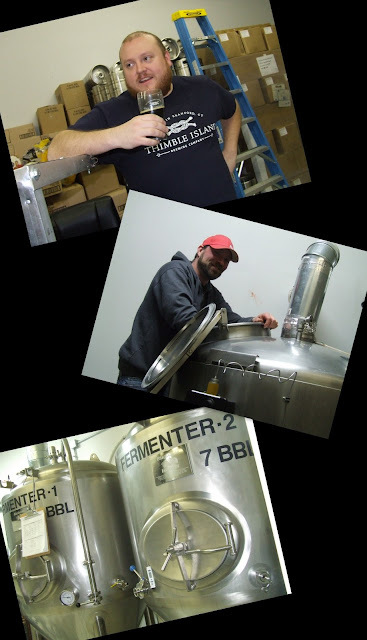 Just a short detour off the beaten track in Branford, CT is a pint-sized brewery with kegs of potential - Thimble Islands Brewery. I dropped by the other day and the place was packed with people. By packed I mean that the tasting area had about a half dozen folks hanging out sampling beer and there wasn't a whole heck of a lot of room to move around. Hey, I wasn't exaggerating when I said it was small! I was promptly offered a sample by tap-tender Sarah. 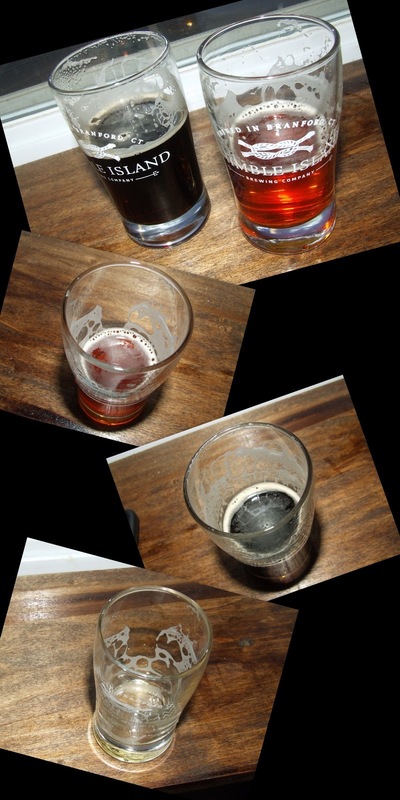 I tasted both of the their offerings - an American ale and a coffee stout. After enjoying the brews, I introduced myself and was offered a tour by co-founder Mike Fawcett. Was I interested? Hells ya! Thimble Islands was founded in 2010 by a pair of enthusiastic homebrewers, neither of whom had ever apprenticed with a master brewer. 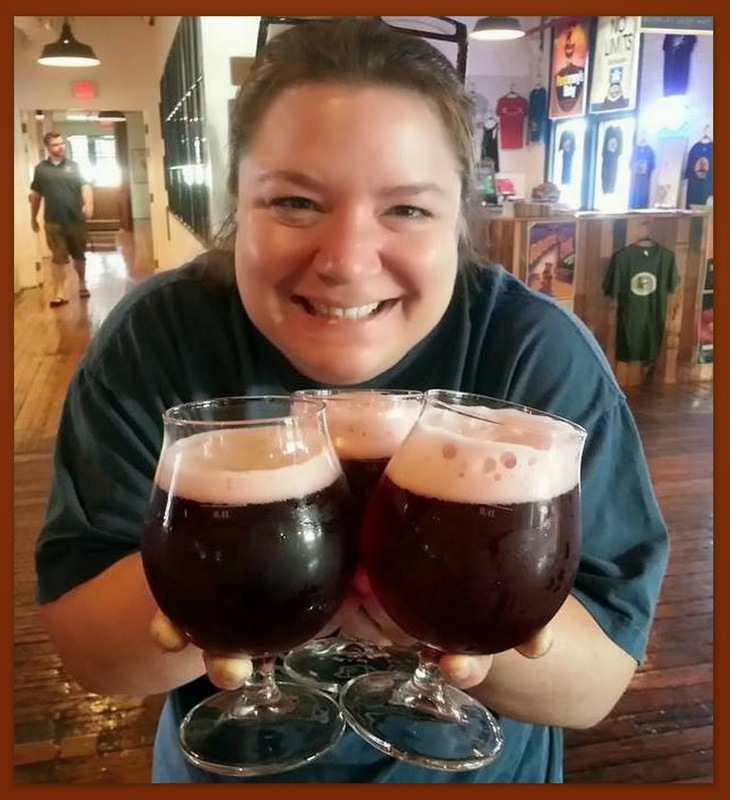 They started their business with a passion for beer and a dream. They wanted to create beers that any beer lover could enjoy. I think that they succeeded quite well. 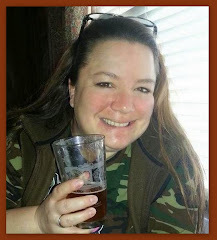 I was particularly impressed with how much of the work they put into the brewery. Most of the equipment they purchased was used and required repair, which they did themselves. They also did a lot of the construction on the space themselves, including the walk-in beer cooler and office area. 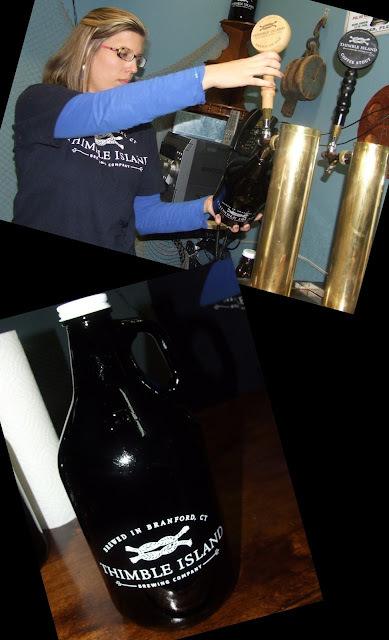 Mike explained that Thimble Islands beer is only currently available in growlers directly from the brewery or from one of the several bars and restaurants that the brewery self-distributes to locally. He pointed out that they will soon have a small bottling line in production to expand their distribution. In addition to the new bottling line, there are other expansions being done. They are currently brewing a little over 20 barrels a month. However, they have recently purchased equipment that will allow them to increase their capacity to up to 100 barrels a month. Hmmm . . . perhaps a new recipe or two is in the works as well?? I don't know - *hint* IPA *hint* - just askin'. The beer . 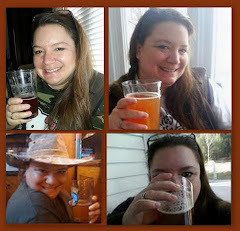 . .
American Ale (5.25% ABV) is a red ale. It pour a clear amber with a creamy white head that leaves behind appreciable lacing. It has a mild hop and rich malty aroma. I was first impressed by the creamy, full mouth feel - really, quite nice. The flavor I tasted most was a nice toasty malt. Very tasty with hardly any bitterness. This is a very fresh, clean tasting beer - very drinkable. There is nothing in-your-face about this brew. It is simply a great every-man's beer. Overall - excellent and my personal favorite. Coffee Stout (6% ABV) is a new brew for Thimble Islands that features whole coffee beans from Willoughbys, a Connecticut coffee roaster. It pours a deep mahogany brown with a thick, off-white head that clings to the side of the glass leaving behind layers of lacing. The aroma is coffee and malt. The flavor is a little smokey with a nice coffee flavor that doesn't overpower the roasted malts. It is medium bodied and lightly effervescent on the tongue. This is a nice middle-of-the-road stout with good flavor. A beer any stout lover would like. Overall - very good. What I appreciate the most is that these recipes were formulated by home brewers with no commercial beer making experience. They developed these beers with their own ideas about how they wanted them to taste and without the influence of a master brewer. I think they did a great job in creating a pair of good, well-balanced beers. I look forward to whatever they come up with next. 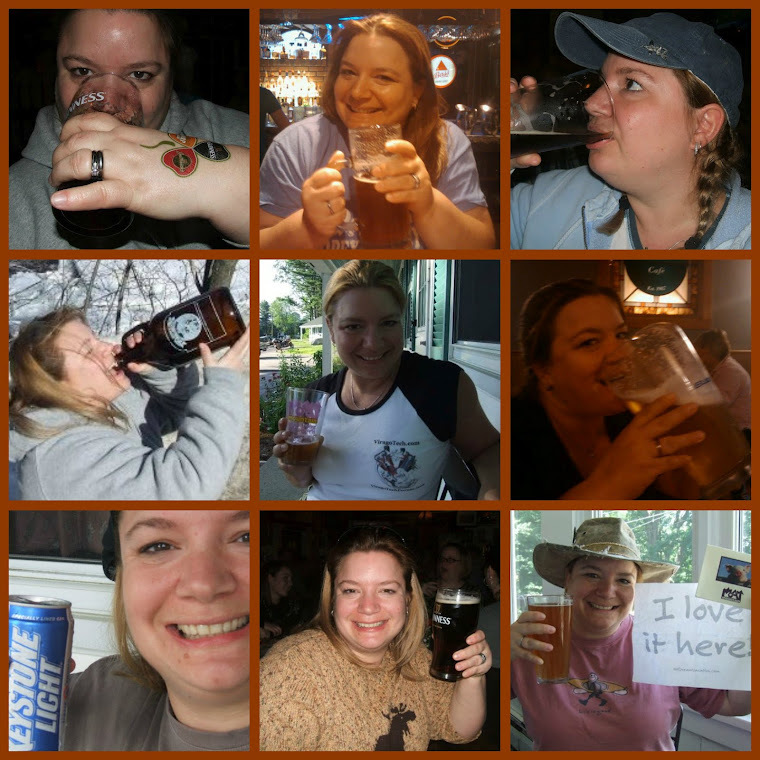 I went home with a growler tucked under each arm with a smile on my face and quite happy that I paid Thimble Islands Brewery a visit. 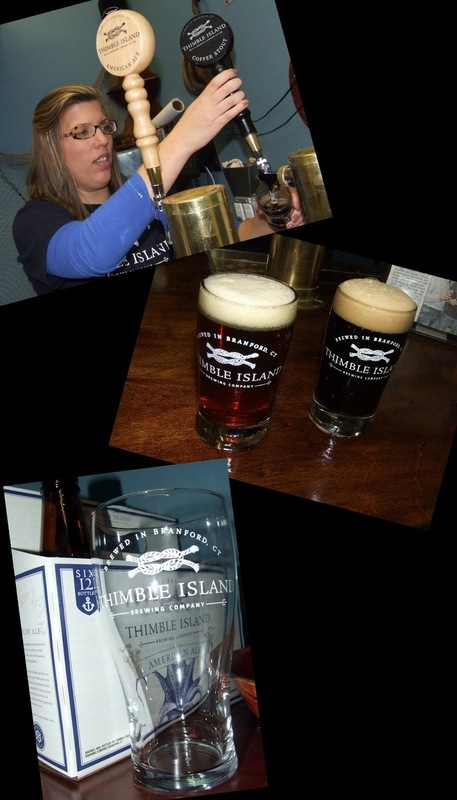 Visit Thimble Island Brewery's website or check them out on Facebook.